A slogan adopted years ago after many Oregon Trail concerts and other explorations: okay, but is it complete? My fiddle is a love affair. 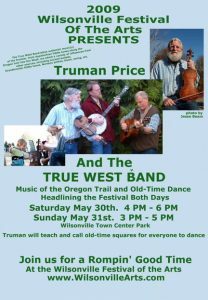 Mar 30, Sat – Polk Folklife Festival, at WOU Student Center, Monmouth; 10-6, 2 things: hosting jams in “Truman Jam Room”, inc. “led jam”session 2-3 pm: Music of the Oregon Trail. All welcome to join in. 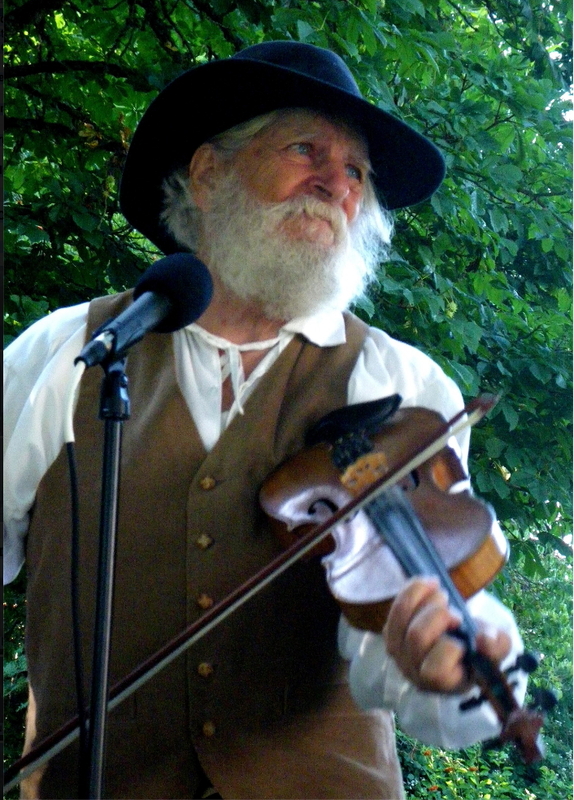 April 12, Fri, 10-11:30 a.m. – for OOTFA State Convention in Rickreall, “The Sources of Old Time Fiddle” , with samples from 10 traditions; a workshop. March 31, Sat – Polk Folklife Festival, at WOU, Monmouth; 10-6 (hosting jams in the “jam room”). May, memorial day weekend– NW Folklife Festival, Seattle ..
July 17, Wed., 2 pm. Waverly Place, Albany. Sept. 8 Sat – Square dance party, private, Oak Grove Road 3-5; with Worn-Out Shoes. Sept 15, Sat – Brown House Heritage Center, Stayton, for an antique car rally (! ), 1-3 pm. solo. Sept 22-23 – Party at our house – Big ate E one! 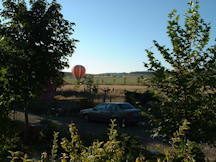 pre-party cider squeezing around noon, our apple trees… then all night music; some folks will camp in the orchard. 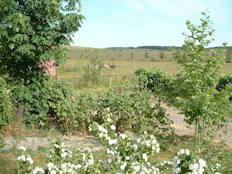 Sept 29, Sat – Brunk House, by Hwy 22 E of Rickreall, 11-1, solo, for Heritage Soc. Apple Festival. Dec. 12 Wed – the annual dance for the Guadelupe, St Patrick‘s Church, Independence, 7 – (& great food after). . About the Dancers for Guadelupe Celebrations [[Description & 2-3 photos] Brief sample here. “Oregon’s leading student of music of the Oregon Trail era…” ( I like several kinds of music). There are a few old video song links near the bottom of this page.
. Last summer was nice. Fiddled about half of all Sunny Saturday Mornings at the Independence Saturday Market. On the first warm spring day I was good for about 2 1/2 hours without a break, trying to play as wide a variety of songs and tunes as I can: at the end of each tune or song, go straight to the next, but change key, and genre, and alternate between tunes and songs with lyrics. Later, I wrote down the tune list, 60+ of ’em… tunelist here.
. Still hoping to figure out how to continue the Square Dance series. Nothing firm yet. 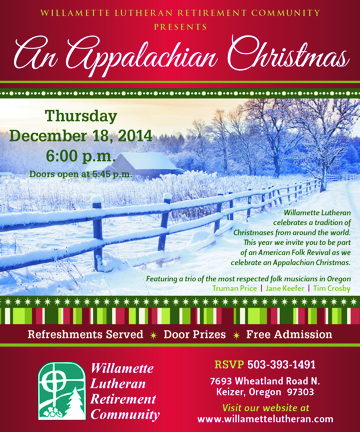 Will still have 2-3 at Champoeg Park in summer.
. Enjoyed The Elements that made Old Time Fiddle, a program at Brown House, Stayton, June 2018. 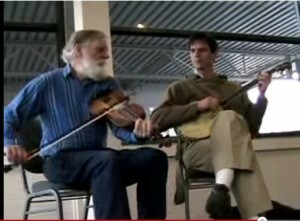 Mark Babson had sampled baroque/classical/romantic violin pieces; then I presented an overview of 10+ different threads that combined to make old-time fiddle, starting with the oldest tune, Soldier’s Joy, showing how it can be played many ways but is still the same; a tune played in an open tuning; describe the Scots/Scots-Irish migrations to Appalachia and the Mixolydian mode of the bagpipe chanter; the influence of African-American fiddlers; their synthesis in a tune learned in the New River Valley; for contrast, a regular New England/Eastern Canada tune; a French Canadian tune; in response to a question, stories about the Metis fiddlers; the influx of rags; swing; Scandinavian; a Norteno tune; aand, for where do all these tunes come from, why I made up “The Swallows”, and played that. A one-hour romp through Old-Time Fiddle as I see it.) A hit.
. The St. Paul Rodeo July 3 also was fun. I got to open for, and play the rest breaks for, the Bronco Billy Band. Alternated old country-western songs with every tune I could think of that mentioned large animals, finishing with a favorite about a rodeo rider, Sweet Wyoming Home, yo-de-lay-ee oo..
. The “Steam Punk Jane Austen Ball” near Halloween was a kick — dozens of extraordinary costumes wending through the hospitality tables in the formal Grand March around the upper floor of the Mission Mill Building, straight into squares and reels.. I love doing this stuff! The eclipse centered over our house, so we had an all-weekend nonstop party. Moon songs at eclipse party: Bruce Reid, human jukebox, had an incredible store of songs mentioning the moon. Here’s some of us: Vivian Williams, Adam Price, myself & Suzi, W. B. Reid, Kevin; but we were all one-upped when after a few hours we reached a lull and an 11-year old stranger who was camping in the pasture stepped to the piano where she played a clean, simple and elegant Claire de Lune. 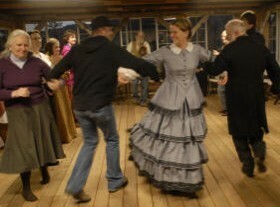 Solo fiddling and calling, an 1800’s Reel at Newell House, , for an authentic 1859 dinner and dance. 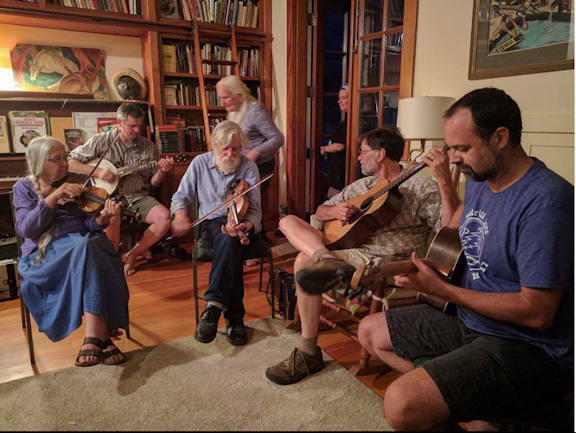 Appalachian fiddle tunes: There is a very nice Appalachian fiddle tunes jam in Keizer on the second Sunday of each month. Inquire here, or of Roger Applegate. Here’s a few recent tunelists. Same group sometimes at our house on the Fourth Sunday, summers, erratically. About half of the core group of 15 or so musicians show up at any particular jam. Inquire. General fiddle jam: in Corvallis, 1st Thursdays of each month; at Old World Deli, 7 pm; hosted by OOTFA … A good varied jam . Second Wednesday every month, a few friends practice/perform for a small but regular audience at the Monmouth Senior Center , 6:30 – 8pm; musicians and listeners welcome! 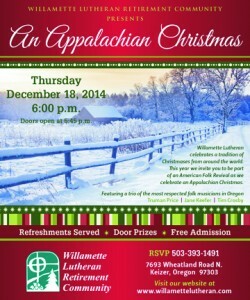 “An Appalachian Christmas” with Jane Keefer and Tim Crosby was such a fun gig! Asked to present a one-hour program, we studied, practiced once and nailed it: simply great: widely varied, perfect; many groups around the valley would love to have it — if only they knew about it!
. Might also mention OT dance: have called over 100 evenings of dance for various adultish groups; because of that, taught old-time dances to about 15,000 kids grades 1-6, in 60+ schools, through Artists in Schools. 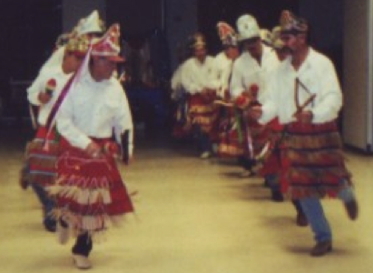 <— Aside: For 25 years I’ve been the fiddler for the annual Guadelupe dances on/around Dec. 12 with the local Mexican community. A wonderful experience. Anyone can attend, and the food is super. 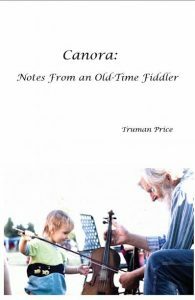 Lessons: I’ve taught, beginning violin to advanced fiddle, for many years. Several former students have become players and bandleaders. Also have enjoyed doing a workshop “fiddle for violinists” , seven times for NW Folklife in Seattle and also for the Oregon Oldtime Fiddlers annual convention in Rickreall. From the desk window in Early Spring . . . . . . Same thing in June, with organic Jerseys . . . . . . Hey, Stop Scaring My Cows! Books: We make part of our living selling antiquarian books, especially children’s literature, and Suzanne’s site at http://www.oldchildrensbooks.com is really nice. 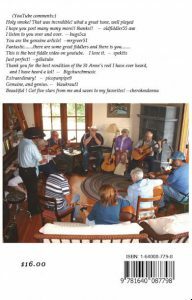 Also I offer a few hundred titles of folk music which can be searched here. (not my personal collection of a few hundred more) For more titles, change the keywords… e.g. “music” or “fiddle”.